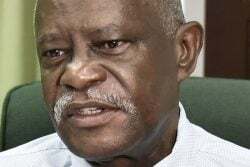 The single event responsible for the world really taking notice of Amerindian art as a major subject and its rise to its present power was the exhibition of six men identifying themselves as ‘Lokono Artists’ at the Venezuelan Cultural Centre in 1998. This was a group led by Simon out of St Cuthbert’s Mission that included Hussein, Linus Klenkian, Telford Taylor and Roaland Taylor. This group of sculptors and painters for the first time put on show in one place some of the most important characteristics of the art that had emerged. 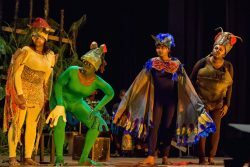 This work, much more than any other exhibition before it, was influenced by those ingredients and exhibited those factors that give meaning to Amerindian art. The Lokono are Arawaks and these artists showed the close relationships between them and their environment, between their environment and the art. It represented the spiritual beliefs, the closeness to nature in the spiritual presence in the things of nature, the forest, the birds and other animals; the mythology and the way men can transform themselves into forest animals and how spirits take the form of birds and other animals. The show by Six Lokono Artists was the most important exhibition of Amerindian art up to that time and established the arrival of this brand of work and its prominent place in Guyanese art. There was first of all the identity. This was foregrounded by the men through the unmistakable ethnic identity in the exhibition’s title. That was taken a bit further in the choice of language, that is in the use of ‘Lokono’ rather than the better known name ‘Arawak.’ This communicated a greater depth of meaning made more significant by what was contained in the works themselves. That was the groundbreaking exhibition not because it was the first to put Amerindian art or the peculiar characteristics of it on show, but because of the statement that it made. Of particular note is the way sculpture is used. Linus Klenkian has spoken about collecting wood for his art and gives meaning to the closeness between the medium and the forest in addition to the way the images that are created reflect the forest environment. Wood carving influenced by the spiritual is well known among intuitive artists in Jamaica, and this was escalated into prominence by Malika Kapo Reynolds, for example, decades ago. Very intricate motifs are also one of the great hallmarks of Guyana’s Philip Moore, but more than in any other art in the Caribbean, there is a profound empathy in the tales told of the forest in Guyanese Amerindian sculpture. It is informed by the ethos, the cosmos, myth and spiritual beliefs. Nature is not only trees, birds, and animals, but a oneness between these, the environment and the spirit of man. The Animism and Folklore recorded in the writings of Walter Roth find visual expression in the prevalence of mythical birds, bird-shapes and grotesque bird-like images in the sculpture. The same goes for animals such as serpents, jaguars, mythical and grotesque animal images. These abound because of the belief that given the learned skills, man can transform himself into these creatures and achieve empathy with the forest. Human spirits can take the form of animals. As was so fascinatingly fictionalised in Pauline Melville’s Ventriloquist’s Tale, hunters can learn to become one with the environment, to acquire the skills of ventriloquism and shape-shifting. But dominating these particular beliefs is the presence of Kanaima. Mythology has it that Pia (who became the good medicine man – the piaiman) and Kanaima (who became the malevolent, cruel kanaima) were twin brothers, alter-egos who grew into opposites of each other and opposing human forces. However, many have emphasized that kanaima exists and he is not a myth, but a man. Just like the hunters, men can learn to be kanaima, take the shape of the jaguar, whistle like birds and hunt down their foes or prey. They are often assassins who pursue their victim relentlessly. These personalities are frequently reflected in the sculpture as in Shaman and his Medicine or in Snake Walking Stick, both by Roaland Taylor, as well as in Valentine Stoll’s Male and Female Deer : We Are One or Arapaima by Oswald Hussein. Another pertinent form arising from this may be found in Telford Taylor’s totem poles and the much smaller Totem Pole: Good Spirit by Stoll. 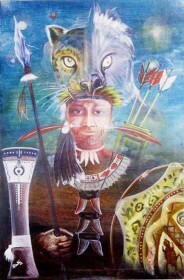 Hunters and Kanaima find representation in Hunter’s Visage by Winslow Craig, Jaguar Attacking and Native Hunter by Stoll. Among the painters there is much use of what George Simon calls “transformations,” which relate closely with both the protean Kanaima and the various spiritual onenesses. 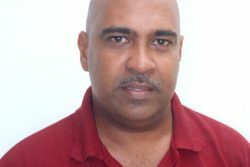 His student from the University of Guyana, Anil Roberts, employs it in Nature Love (2010). It appears to be a detail from the magnificent mural Palace of the Peacock: Homage to Wilson Harris on the university campus. Roberts goes into nature, but depicts the oneness of man and the landscape in the way he merges the figure of a girl with a waterfall, a river, a lotus flower and an eagle, punctuated by petroglyphs. The body of a girl becomes the Kaieteur Falls in keeping with images from Harris’s novel in which a female figure appears clothed in the mist of the falls which transforms itself into an illusion of a woman wearing a garment made out of her own hair. The discourse on Meanings in Amer-indian Art which celebrated Amerindian Heritage Month in September 2010 focused the work and background to the work of the three foremost Amerindian artists. It is interesting how this work and its influences tell much of what there is to know about Guyanese Amerindian art. The leading sculptor Oswald Hussein is very much a living symbol of the art. A native of St Cuthbert’s village, he has achieved empathy with his environment and identifies himself with the forest and the landscape.